Three persons were confirmed dead while 11 others wounded on Friday in an accident involving a white Mazda bus and a Tipper at Sowo village along the Abeokuta-Sagamu Expressway. 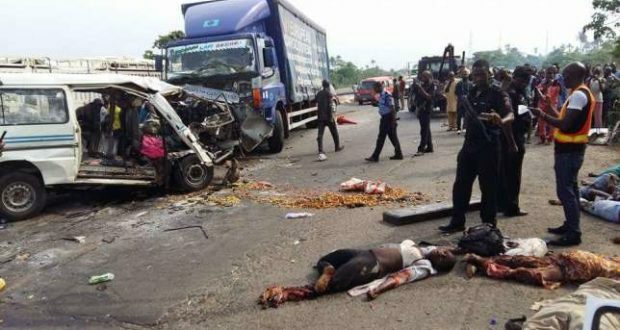 The Public Relations Officer of Traffic Compliance and Enforcement Corps in Ogun State, Mr Akinbiyi, in a statement on Saturday, confirmed the incident to journalists in Abeokuta. Akinbiyi disclosed that the accident occurred around 7:30pm on Friday and was caused by the Tipper driver who was making an Illegal U-turn before the commercial bus rammed into it. He said, “The commercial bus with registration number AAA 45 XS was loaded from Kuto park, Abeokuta, and was heading to Ketu, Lagos, through the Abeokuta-Kobape-Siun-Sagamu/Interchange Expressway when the accident happened. “The Tipper with registration number XS 764 AGL caused the accident by making an illegal u-turn and wth no illumination (full light) to indicate a vehicle is making a U-turn, before the bus oncoming ram into it. “A total number of 14 passengers were in the bus, eight female and six male. Three male died while eight female and three male sustained various degrees of injuries,” he said. He said that the injured victims were receiving treatment at the Federal Medical Center, Idi-Aba, Abeokuta; General Hospital, Ijaiye and Joseph / Christianah Hospital, Oke-ilewo, all in Abeokuta. He added that the corpses of the deceased had been deposited at the General Hospital, Ijaiye, Abeokuta. He, however, stated that the driver of the Tipper ran away.